Connect any two USB-C or Thunderbolt™ 3 enabled devices like a tablet, smart phone, or laptop. 1,375 In Stock & ready to ship! & ready to ship! This one cable offers high speed data transfer, 4K video support, high bit depth audio, and power delivery. Get more done with less hassle by carrying one cable to complete nearly any task. Stream video and audio with full DisplayPort 2.1 and 'Alt' mode functionality, displaying up to 4K video with amazing contrast and color depth to see photos, videos, and text with unbelievable detail. 4-channel audio with microphone support ensures crisp lifelike audio delivery. Ensure that a USB-C equipped laptop, smartphone, or tablet is fully charged and ready to go while displaying video content, transferring files, or streaming audio. Deliver up to 100W of charging power to or from the connected device with smart power delivery. The USB-C cable offers a light-weight, portable, and simple way to deliver video, and data—while staying charged up! The USB-C connector has a robust design, allowing for the connector to be plugged in and un-plugged up to 10,000 times. The sturdy construction ensures that the product provides peace of mind and is built to stand up to the rigors the most demanding on-the-go life. The USB-C connector has a symmetrical design which is identical on both sides, so it does not matter if you plug it in upside-down or right-side-up. It will plug in the first time, every time while preventing damage to the connector port. 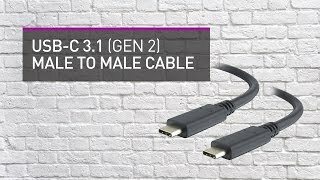 Learn more about the new USB 3.1 Specification and new USB Type-C Connector.